And twice by the dogs was like to be ta’en. 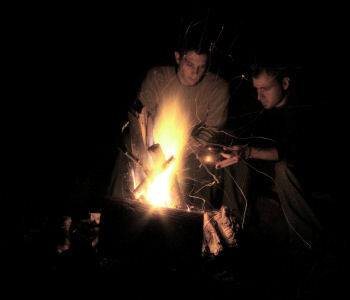 Nestled in the Appalachian Mountains, two witches watch an iron cauldron over low coals, combining root and leaf and bud. It is a classic image of witchcraft, and it is how we work at Otherworld Apothecary. Our lives and our magical practice are inspired by the forested hills we call home. In our mundane lives we are ecologists, with interests in herbalism, botany, and forest ecosystems. Magically, we are initiates of a west-country witchcraft tradition and also utilize the practical methods of Appalachian folk magic which steeps our local culture. We have spent years acquiring knowledge from primary texts, studying our native plants, and learning the magical traditions we use; this knowledge and experience is applied to all we offer. Our services are two-fold. One, we are cunningmen and witches willing to work on the behalf of clients. Our services page can provide you with more information. Two, we are purveyors and creators of the magical supplies and botanical formulae necessary for the Arte – magical incenses, oils, potions, tools and botanicals. Our products are created only with natural extracts, essential oils, and properly identified botanicals collected, when necessary, in accordance with magical tradition. We disdain the use of synthetic fragrance oils, cheap wood filler, chemical dyes, etc; they have no Virtue and no place in magic. You can also be certain that our blends are well-researched, accurately formulated according to magical tradition, and compounded during proper and auspicious times. We develop many formulae for use in our own practice. We use the products we sell, and we demand quality. Whether hedgewitch, ceremonialist, folk magician, or incense maker, the practitioner looking for quality ingredients and formulae will find something to pique their interest and enhance their craft. If you have questions regarding our products or simply want to discuss craft, contact us. We will be happy to help if we can and always enjoy meeting other travelers along the crooked path.